Today was a day of tradeoffs. Should Curiosity focus on driving to get to a higher priority target sooner, or conduct contact science at the current location? Ultimately the Geology Theme Group decided to forgo the "touch-and-go" option, in which contact science is carried out prior to driving, and instead focused on using that time to increase the drive distance. With today's drive, the hope is to make it about 50 meters down the road along the strategically planned path informally known as the "Mt. Sharp Ascent Route." At the end of today's drive, the plan is for the rover to end up within about 2 meters of an intriguing gray hued target, having made significant progress towards a "megaripple" of high interest for helping to further our understanding of Martian aeolian processes. Megaripples are thought to form when the wind regime is not strong enough to move larger particles but still strong enough to move some of the smaller particles by saltation (that is, by bouncing short distances across the surface). Previously, Curiosity has visited several locations associated with the Bagnold Dunes where the rover is conducting a detailed assessment of variability and properties of the dune field as a whole. Before Curiosity drives, away several ChemCam activities were planned including observations on the targets "Cow Ledge" and "Carter Cove." The "Carter Cove" target is located on the darker, more knobby, layered outcrop in the upper left of the accompanying Navcam image. Both of these targets are aimed at refining our understanding of the compositional and textural variability present in the Murray formation. Additionally, Mastcam documentation images of these targets will be acquired along with the documentation of the autonomously selected AEGIS target acquired after the previous sol's drive. An extension of an existing Mastcam mosaic was also planned, to provide additional context along a section of the exposed Murray outcrop. Following the drive, we planned some standard imaging to help with targeting in the next sol's plan as well as a ChemCam AEGIS target, designed to autonomously measure bright patches of outcrop in the Navcam scene. 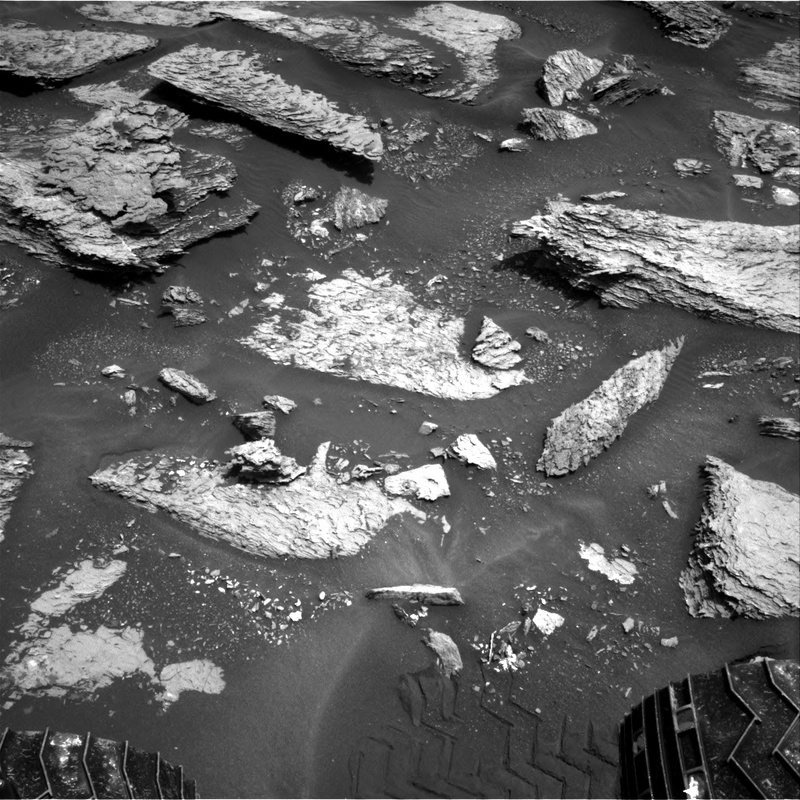 All in all, a good day's work on Mars.